With sales ranging from €150 billion to €200 billion which is US$163 billion to $217 billion every year, as indicated by industry estimates, fake pharmaceuticals are the most lucrative segment of the worldwide exchange illicitly replicated merchandise. World Health Organization (WHO) approximates 30 percent of drugs that reach developing nations are counterfeit and this can have substantial effects for the brand as well as on the patients. Dealing in counterfeits is a criminal offence that not only harms legitimate businesses, but also leaves consumers with sub-standard goods that are often precarious. Thus Counterfeit medicines are turning into a serious concern around the world, and have progressively been showing up through the real pharmaceutical supply chain, including community and online drug stores. Whats more, pharmaceutical companies and regulators are creating ways to stop them. No nations stay untouched by this issue, what was once viewed as an issue endured by developing nations has now turned into an issue to developing nations including US and Europe. We require both countrywide and industry-level participation, and in addition public and private sector coordinated effort, to identify and definitively battle counterfeiters. to adopt mass serialization and other anti-counterfeiting measures starting in 2019. Manufacturers who operate in the E.U. will have to add unique identification numbers to the outer packaging of all prescription drugs, and equip containers with tamperproof seals. To guide customers from illicit online drug stores that supply fake medications, the FMD requires approved legitimate Internet drug stores to show a logo distinguishing them as E.U. approved drug retailers. 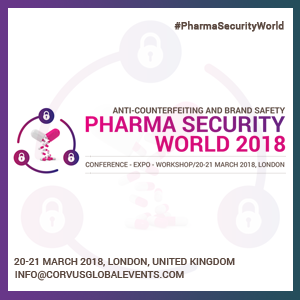 To protect your brand and build a genuine future, Corvus Global Events invites you to Pharma Security World 2018 – An Anti-counterfeiting & Brand Safety Conference, which will have Pharma industry experts sharing various challenges faced, new strategies, case studies and use of innovative ideas and the conference will also offer opportunities to encourage partnerships and collaborations.